Surprise cake - Do You Know The Muffin Man? Recipe from Jamie's Kitchen by Jamie Oliver. Notes: Lots of interesting ingredients including beets, olive oil, ginger, orange and polenta. Batter mixes up purple. This turned out nothing like the photograph in the cookbook: it's very purple, dense and moist, like a pudding (in fact, it's called surprise pudding in the index). Oliver tends to use quantities like “a handful” or “heaping spoonful” so perhaps my “juice of one orange” made this cake too wet. 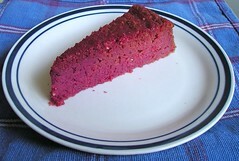 Anyhow, a good way to use up beets.